If you have ever seen one of those overdramatized American car shows on which they take a wreck, thrash it in the workshop for a few weeks and modify and fix it up before selling it and hoping to turn a profit, you will understand the life that Matt Gibson lives. It might be minus the cameras, fake drama and paycheck from Discovery, but the steady stream of cars and bikes flowing in and out of his workshop over the past few years has kept him very busy, and seen him work his way up to some pretty cool projects — most recently with his turbocharged Audi A4 DTM, which we featured only a few issues back in NZPC No. 212. But like most of his projects the DTM barely had time for the paint to cure before the keys were handed over to the new owner. “Everything is for sale for the right price, at the end of the day it’s only a car. For what I was offered for it I would have been stupid to say no,” Matt told us. He’s not one to be without a project for too long though, so he began searching Trade Me for the next victim, and stumbled upon a stock 1975 Porsche 911 SC. An early Porsche had been his dream car for some time, although the cash outlay they command has always been a hurdle. But the years of burning and turning projects had now got Matt much closer to realizing the dream. “I did two years working for Motorsport Services, where we ran the GT3 Porsches and plenty of vintage Porsches. I had always wanted an early 911, and then when I started seeing the builds coming out of the States from the likes of the Dapper crew etc, I knew I had to build one. I had been umming and ahhing if it was the right time to buy one or not, but then a set of 964 bumpers turned up on Trade Me, it’s pretty much the only reason I decided to buy it. It was a sign, as the bumpers don’t come up for sale very often.” A phone call was placed to deliver a cheeky lowball, $9000 below the list price. It was flatly refused, but a few days later the owner called back and agreed on the offer, making Matt the proud owner of a slightly rough-round-the-edges vintage 911. The car had been imported from California a few years earlier by a dentist who got it complied, rebuilt the engine from a bare block up and also did plenty of other things to tidy it up, like restoring the gauges and having new carpet fitted. He spent megabucks on it then on-sold it, to someone who never drove it and left it gathering dust in a shed for two years. It certainly wouldn’t gather any dust at Matt’s workshop. It’s been three months since he collected the 911, and he hasn’t stopped working on it since. The first job was fitting the bumpers, which came off a race car and were in a real bad way. The car was handed over to the Shield Bros Panel Shop which got to work, repairing the 29-year-old’s bodywork, fixing and fitting the fibreglass bumpers, and rolling the guards to accommodate the serious fitment Matt had planned. The first of two paint jobs was laid on, a dark-metallic gunmetal grey, though it didn’t stay on for long, thanks to the not-so-millimeter-perfect clearance on the 18x10-inch BBS RS wheels (reps). 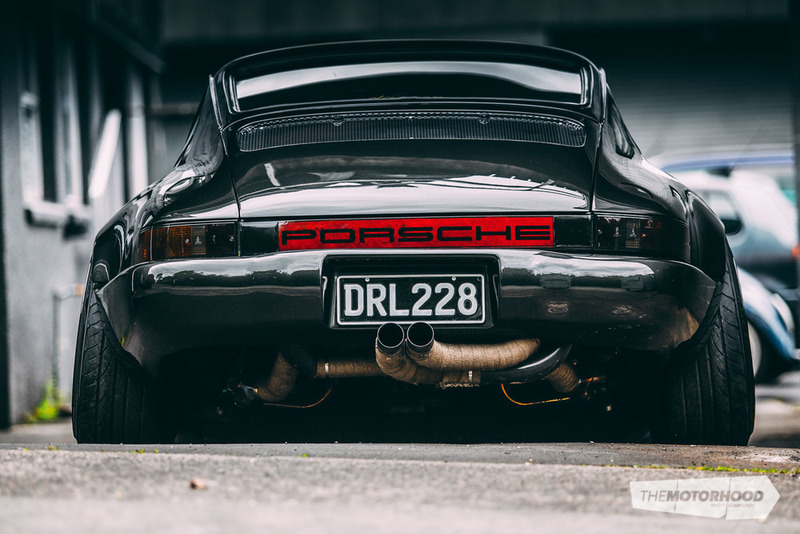 You see the old Porsches run a torsion-bar suspension, and with that wound down and the slightly wrong-size tyre — as in, not stretched enough — the rear guards took a hammering on the very first drive, blowing out both sides. To remedy the issue, Matt got to work converting the torsion-bar suspension to coilovers. With an off-the-shelf set of coils priced up near the $4000 to $5000 mark, he decided to put together a custom set using a mix of KW and Tein components. It was no straightforward project, requiring a serious level of fabrication to remove the torsion bar set-up, with custom adjustable camber arms, spring hats and camber plates required. It now allows the 911 to go seriously low, like catseye-scraping low, and be lifted up within a few minutes. But more importantly, the few extra degrees of camber mean the rear guards don’t take a hammering each and every drive. The interior has been the other area of focus, with a set of KW fixed-back seats and a Lifeline quick-release hub with OMP suede wheel and custom RS door trims giving the entire interior a Targa-like feel as you blast through the back roads, with that flat six 2.7 roaring behind your head. It takes balls to go cutting up a classic car like this, and in doing so you are likely to piss some people off. But we are happy that a few more of this type of build are starting to surface here in New Zealand. It might not be everyone’s cup of tea, but it certainly stands out in the crowd and proves that breaking the mould is sometimes the best option for your next project.